After fielding many requests for an inexpensive yet durable and functional non-rotary vise, Peak has taken the design principles that have served well in the Peak Rotary Vise. The base is slightly smaller and lighter in weight than the Rotary Vise, making this an item to seriously consider if you need a lighter weight travel vise. The base has the durable white powder coat finish that we're known for and it still disassembles and packs flat for ease of transport. The base also includes the additional hole for our accessory shaft (not included) and all PEAK accessories except our Material Clip will work with the non-Rotary Vise. 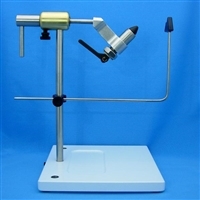 As with the Rotary Vise, optional midge and saltwater jaws are available for the non-rotary Vise. The Peak Rotary Vise is designed for optimal tying efficiency and ease of adjustment and set-up. Materials (including stainless steel, brass, tool steel, and aircraft aluminum) are chosen to last a lifetime of tying. Hardened and tempered tool steel jaws securely hold hooks from size 2/0 down to the smallest you can buy. All adjustments are accomplished with minimal effort. The large stable pedestal base (PRV-G2 model) will hold this vise where you set it, and the non-marking feet protect the surface you set it on. The steel base is powder coated in white, for a surface that will stand up and provide a backdrop you can see your materials against. The base also includes an integrated hook/bead pocket with rounded edges for ease of removal, and our accessory post mounting hole (accessory post not included). The base is designed to pack flat for travel with the vise removed. The rotation resistance adjustment screw provides infinite adjustment and is easily manipulated for right or left handed tyers. 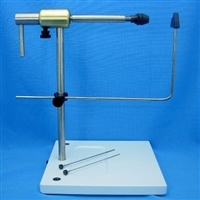 A height and length adjustable bobbin cradle and pivot mount are supplied with the vise. Loosening a single set screw allows the vise to be removed for travel, the brass tip on the set screw prevents marring the vise shaft. Built with the same quality materials used in PEAK’s original rotary vise. PEAK’s Rotary Tube Fly Vise uses a chuck with no collets that require changing, maximizing convenience and minimizing set-up time. The chuck will accept pins and metal tubes up to 1/8” in diameter. The custom-ground pins have a shallow sloped shoulder to hold the tubing. No additional pieces are needed, simply push the tubing up the shoulder until it is held snugly. The vise comes with two pins, 1/32” and 1/16”; other sizes are available separately. Available with PEAK’s Pedestal Base or our C-Clamp (not shown), either option provides the most stable mounting platform available and makes this vise compatible with PEAK’s unique accessories. Bobbin cradle included. Tying big flies for large predatory fish has gained in popularity recently. Common vises don't hold these large hooks well, so Peak engineered a new hook holding system, the Large Iron Retention System. Rather than clamping the hook between parallel jaws, the LIRS system uses a drawbar to pull the hook into a groove to hold it securely. Available in three sizes. And to help you get acquainted with the advantages of rotary tying, Peak's Rotary Tying Techniques DVD. Learn how to tie a Woolly Bugger, Griffith's Gnat, Rusty Spinner, Copper John, Dubbing Loop Leech and Adams. 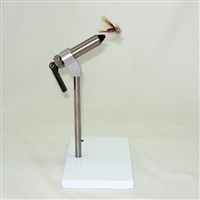 Each fly will show you different techniques available to you using your Peak Rotary Vise. This is a great package for gift shoppers, beginning tiers, to go with a class, or for anyone wanting to upgrade their tying vise and tools. The Base Camp package comes with your choice of Pedestal Base or C-Clamp configuration with the standard jaw installed, plus your choice of the Peak Midge jaw or Saltwater jaw. Also included are Peak's versatile Accessory Shaft, Brass Riser, Brass Screw Kit, D-Arm, 2 Material Clips, and the Peak Tying Tips DVD. Perfect for the tyer looking for the very best.